Press Release Sjödin Motorsport / ÅBM Racing 2014. Sjodin Motorsport goes for the championship in Top Doorslammer! 2014 will be the first year for Sjodin Motorsport / ABM Racing, who is stationed in Taby Sweden to make the whole Scandinavian Top Doorslammer series. The goal is of course to be at the top of the podium at the end of the year and have starting number 1 for 2015! We are working right now with the preparations for the season. Ordering spare parts, the bus will be cleaned up and some updates will be made on the Chevelle. If you want to go really fast you have to give the car some love. During 2013 we did some really big investments and updated the car to go only 1/8 mile racing. Last year we only made 11 runs with the car for various reasons. But, for the first time ever we started to get it to work like we want it to do! We did just roll the dies for a set-up and made a new personal best with a 4.10 @ 185.20 mph (298 km/h) with some shake and pedaling down the track. “The performance to go really fast is in the car. 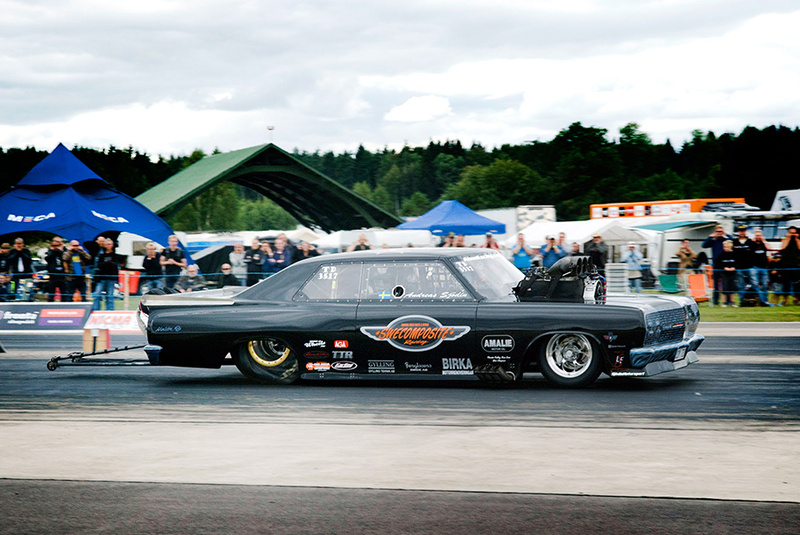 This combined with a well working crew made me feel that it is time after eight years since I started the construction of the Chevelle finally make the whole Top Doorslammer series”, said driver and team owner Andreas Sjödin. In the late autumn last year we started to work and search for new associated partners for the season of 2014. And this really paid off. 14 brand new partners, combined with the continued confidence of our existing partners have made it possible for us to make the dream come true! Everyone knows that you need to train to become the best. Our plan is to do three pre-season tests on different tracks to get as prepared as possible for the first real race in Sundsvall in the end of June. “I feel the need to get comfortable in the drivers seat again. After about ten months at home on the couch I have almost forgotten where the steering wheel is in the car. And also, the season is so short here in Sweden so personally of course I would like to race the car as much as possible during the summer “says Andreas. This madness would never be possible without our sponsors and partners. Therefore we would like to say a big thank you to the following companies. Åkes Bil & Motor, Birka Motorrenoveringar, Sjödin Motorsport Race Cars, Swecomposite, LSF Custom Lackering, Swelube Amalie Motor Oil, Sjödin Network, AGA, Winassist System, Anders Bremö Byggnads, R2B2 Race Cars, Fuel Clothing Sverige, Bengtssons Smide, The Parts Stop Sweden, TF Performance Clutches, Nicma Tools, T.Grundström Plåtslageri, Pro Tools Peter Hult, Stockholm Gourmet, Dragracing24.com and Bil & Glasdesign. See you on the tracks this summer! !